For most people, it’s a simple question; "may I take your order?" These aren’t words that would generally elicit an intense emotional response. But for Cynthia Walker, those five words brought her joy many of us cannot begin to understand. It’s not the words themselves, though – it’s that in her 20 years, few people have used Cynthia’s language to ask the question. “Typically when we go up to order somewhere, Cynthia tries to do it herself, but I usually translate everything for her,” says Cynthia’s mother, Terri. That’s because Cynthia has lived with a birth defect called CHARGE Syndrome since birth. CHARGE is so rare, it only affects about 10,000 people worldwide. Among other difficulties, the disorder has made Cynthia deaf. Neither hearing aids nor other modern devices can restore any portion of her hearing, leaving Cynthia to use sign language for any and all communication. Cynthia’s mother helps translate for her when they’re in public, but interactions with others aren’t without their complications. 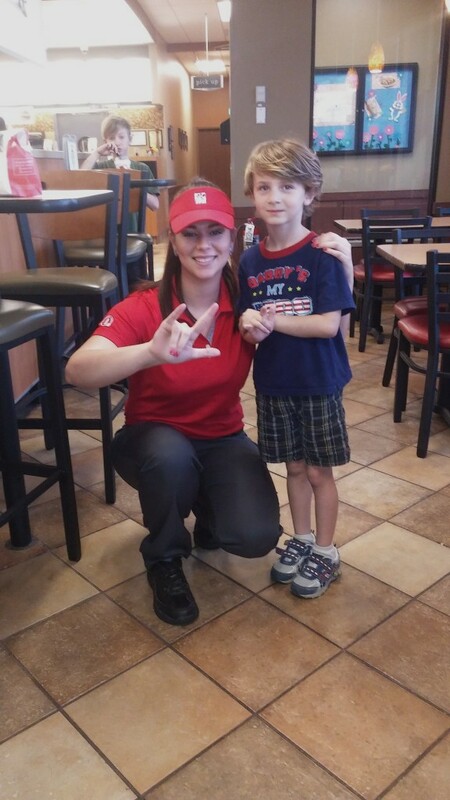 So when Terri learned of an employee who speaks sign language at her local Chick-fil-A restaurant, she decided to surprise Cynthia with a chance to experience a basic, human exchange that most of us take for granted: ordering a meal without struggle or assistance. So Cynthia walked up to the counter to ask for her favorite meal, not knowing what would come next. To her surprise, the employee not only understood, but smiled and responded in fluent American Sign Language. The employee —Taylor Ainez— is not hearing impaired. She picked up sign language from her aunt and uncle who are both deaf and taught her how to sign at a young age. “My manager didn’t even know I signed when I was hired, so my coworkers were all shocked when they found out,” says Taylor, who had only signed at the restaurant a couple times before she met Cynthia. Taylor poses with a child who is deaf and traveled to the restaurant to sign with her. Moved by the moment between Cynthia and Taylor, Cynthia’s stepdad captured their exchange on video, which has now taken the internet by storm. Since posting, the video has drawn so much attention that deaf individuals from around the state have made plans to travel to Fayetteville, N.C. in hopes of a similar experience at the restaurant. 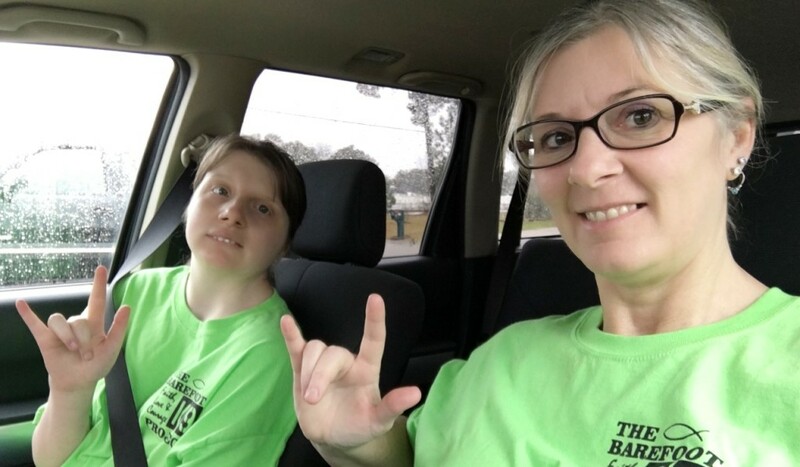 Terri hopes the viral video will bring more awareness, not only Cynthia’s syndrome, but also the deaf culture in general. 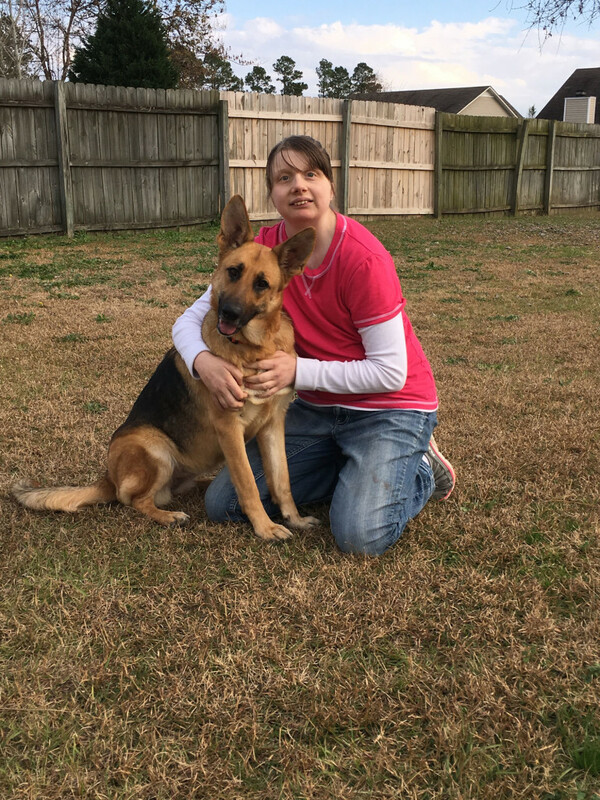 Terri, who has been full-time mother and caregiver to Cynthia, is also working multiple jobs to help raise money for a guide dog and has even set up a GoFundMe page to help support the effort. Her life has very much been centered on helping make her daughter’s as normal as possible. Cynthia poses with her potential guide dog.